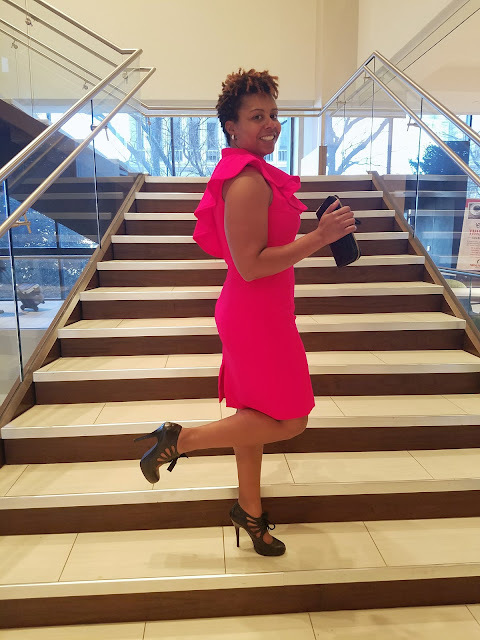 Obviously, the first thing I thought about for this late January post was a red dress for Valentine's Day. 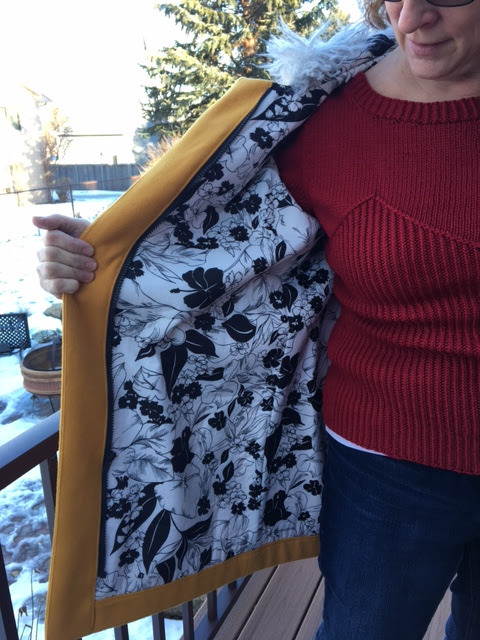 My original plan was to whip up M7534, one of the new McCalls early spring patterns. It looks like a fairly simple pattern that could be whipped up in a time for Valentine's Day for all you procrastinators (like myself) and could be dressed up or down. I loved this pattern at first sight! Especially View D, wrap bodice, bishop sleeves, maxi skirt...What's not to love. So I hurriedly check the website for a red fabric to make an exact copy of the pattern envelope. 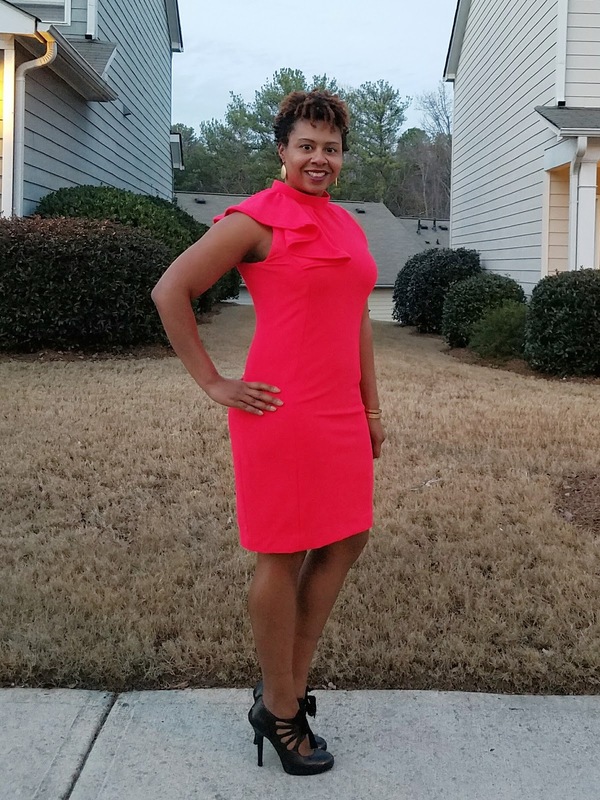 I decided on this Bright Strawberry Textured Crepe Double Knit and not so patiently waited for it to arrive. Well as soon as it arrived I knew I would have to change my plan. I guess I was so wrapped up in the strawberry color and the crepe texture that I overlooked the double knit part. 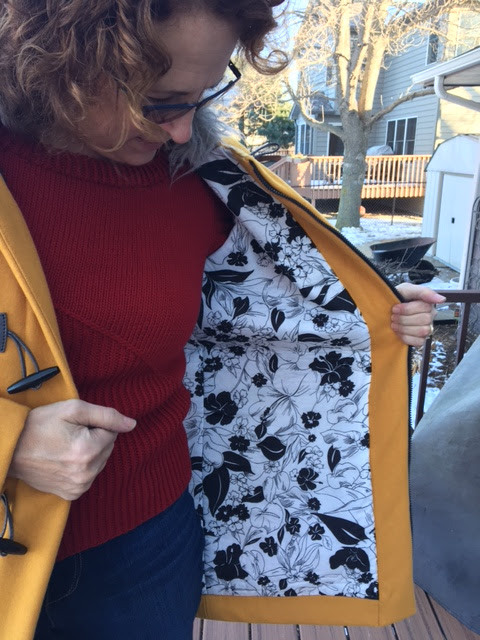 This fabric was too heavy for a pattern that calls for crepe, stable knits or challis. My bad as it is clearly described as light/medium weight. Not to mention it's a double knits, so I should've known better. Again I think I stopped reading at crepe. That said I LOVE the fabric, the body, the texture the color, the fabric is amazing! I am thinking about purchasing the grape color. How did Fabric Mart know red and purple are two of my favorite colors? The bright strawberry version is actually an interesting color, it is a pinkish-red. I think from a distance it looks red but if you hold it against a true red it starts to look pink. Either works for a Valentine's dress! What to sew? What to sew? What to sew? 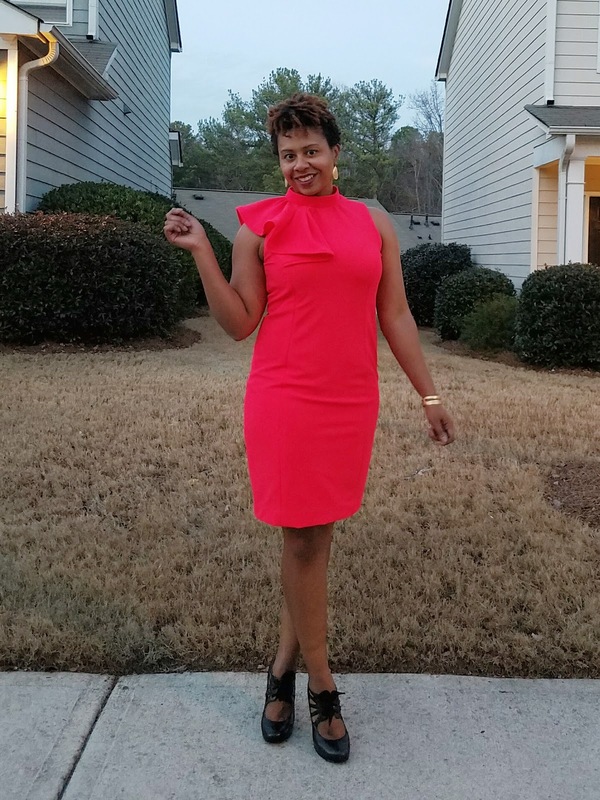 I decided to switch gears all together and create a little red dress. This actually worked out better because the red dress I had in my closet is too small (for shame!) and every woman needs a little red dress in her wardrobe. They are just as useful as a little black or white dress. I chose Vogue 1513 which I had recently purchased after eyeing it for a while. The flounce at the neckline intrigued me and I love this silhouette (even if my body doesn't anymore LOL). Ponte knit, along with wool crepe and wool jersey are the recommended fabrics. SECRET: Because I prefer the comfort of knits (who doesn't love a little breathing room) I never hesitate to use a stable knit on fitted dress patterns that call for wovens. I may go one size down depending on the amount of stretch but I haven't had any issues. At this point in my sewing journey I typically sew garments without looking at the instructions, however I wasn't sure how the flounce fit in to the process so I actually followed them fairly closely. I have to say the instructions were very clear! 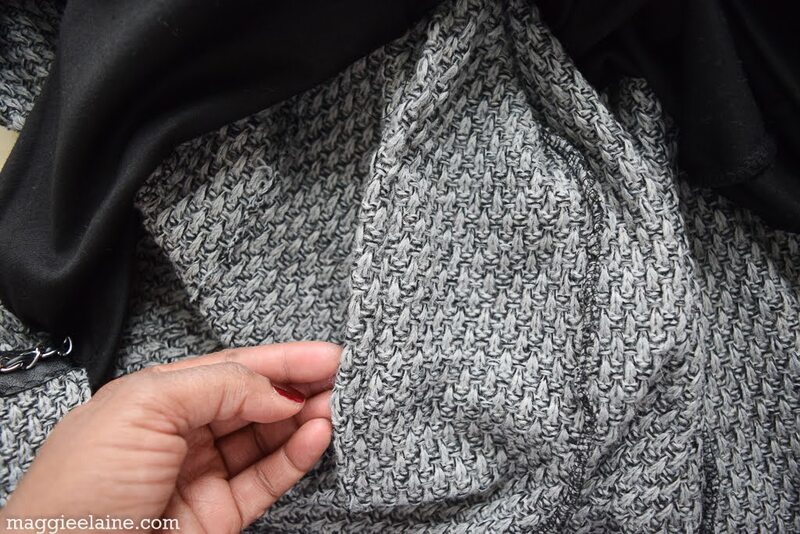 I've never seen interfacing applied directly to the main fabric as it is on this pattern. 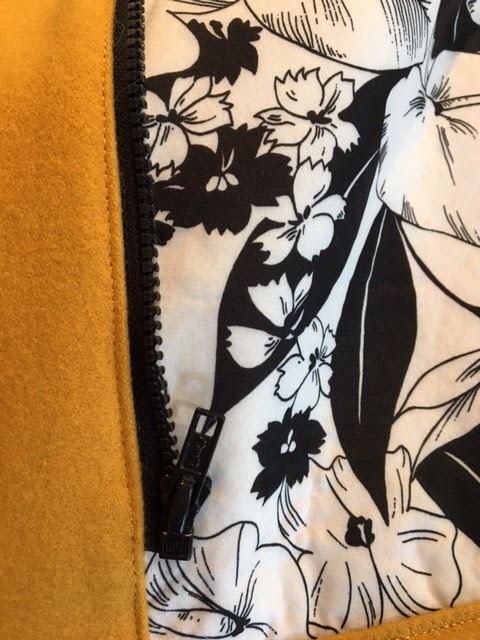 Interfacing is applied at the neck and arm holes as well as the zipper and vent areas. The flounce was a pain to cut because of its irregular shape and all the marking that needed to be transferred but sewing it and attaching it to the dress was simple once I understood how it was attached. (again the instructions were clear) The rest of the dress is simple as it is just a princess seamed dress. The lining does add a little time to the construction as I hand stitched the lining a the armholes, hem and along the zipper tape. For once I found the hand stitching therapeutic, maybe because I was so pleased with this dress that I didn't want to take any shortcuts. I wasn't sure how I would felt about the collar going into this project, but I wasn't sure how to omit it. In the end I don't mind the collar and feel it is necessary given the construction of the neckline. The one issue I did have was attaching the lining to the collar. At this point the bodice front and back are interfaced as well as the collar which has double thickness and you are to attach the lining. This is 3 layers of fabric and 3 of interfacing plus the lining you are attaching! I had to go slow on my machine to get all of this through. Perhaps if I had used jersey or lighter crepe this wouldn't have been an issue. I cut a size 14 at the bust and then graded to a 16 at the waist and hips. After constructing the main fabric I tried on the dress and decided I to remove about 1/2" from the side seams as well as use a 3/4" SA for the center back. It was not loose but in a knit I wanted closer fit to allow for some stretching. (Also I plan on loosing some weight this year-I just joined a 12 week challenge- so I did want it to be too large in the future). I'm sure a 14/16 would work for a non stretch or a low stretch woven. All in all I love this dress. I'm not sure I would sew another right away as the dress itself is distinctive, but I would love another one in black or white. We'll see. Hope all is well! 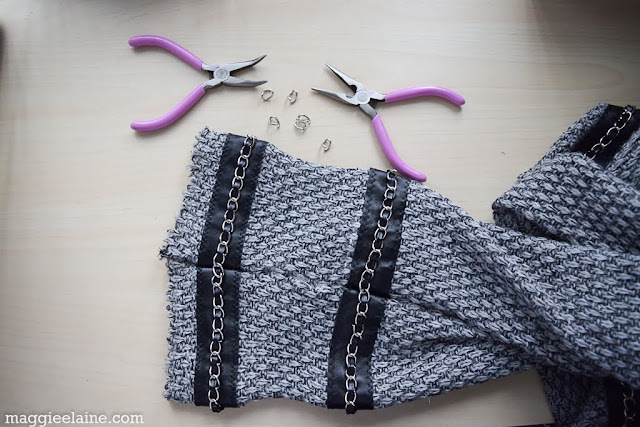 Have you ever wanted to make yourself a comfy chunky sweater, but you don’t know how to knit? Well, my sewing friends I have good news! You don’t have to know how to knit to make yourself a chunky sweater. 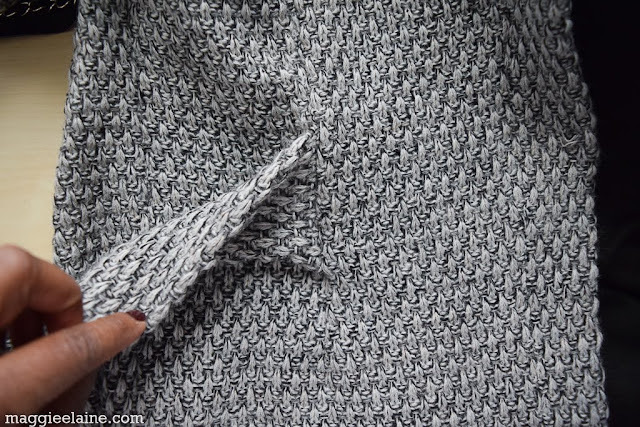 You can just buy chunky sweater knit fabric by the yard to “sew” yourself a sweater! 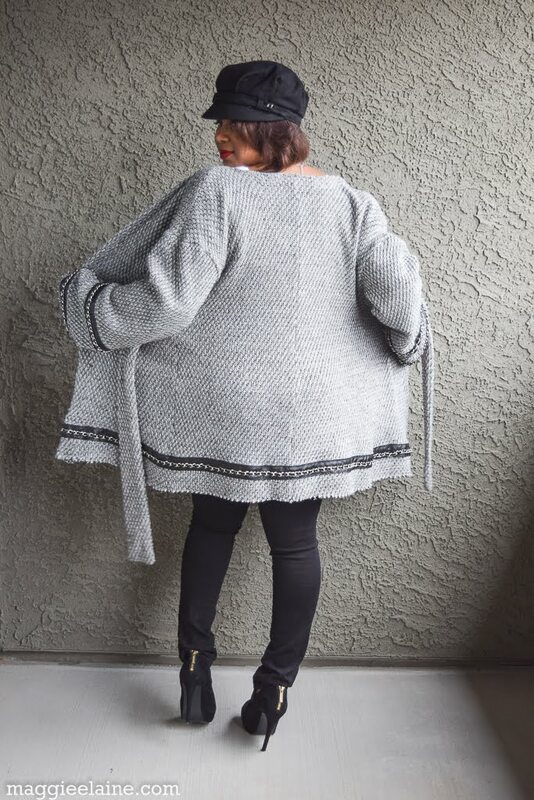 Many, many years ago, I had the best chunky sweater knit coat a girl could have. 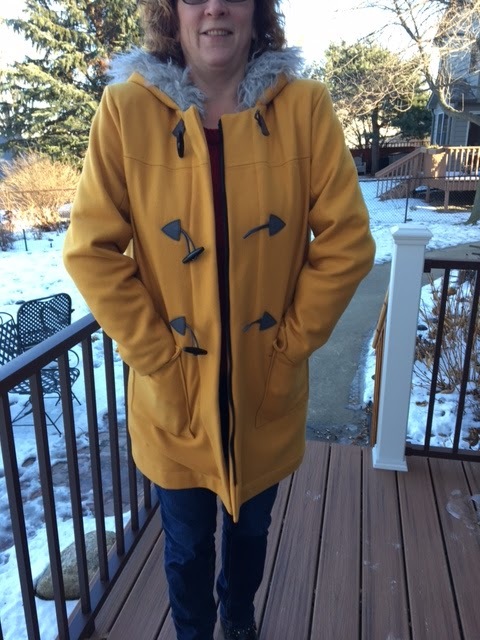 I loved my sweater knit coat so much that I wore it even when it began to come apart in multiple places. I did not know how to sew then, but I hand-stitched the holes together. My stitching was very poor and the thread never matched. However, I figured if I stood at certain angles, no one would notice. 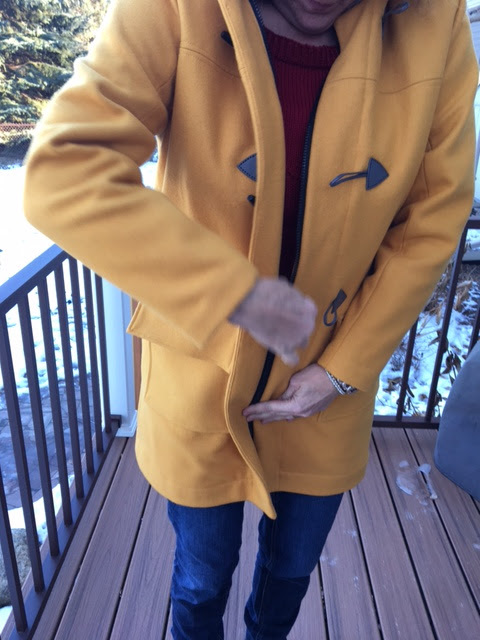 One day, my beloved sweater knit coat came apart at a side seam, and before I could get home to “fix it”, the entire side of the coat unraveled. It was done! Such a sad day. Not too long after the loss of my coat, I had enough confidence to believe I could learn to knit and make myself another one! So I signed up for a 2-day knitting class. 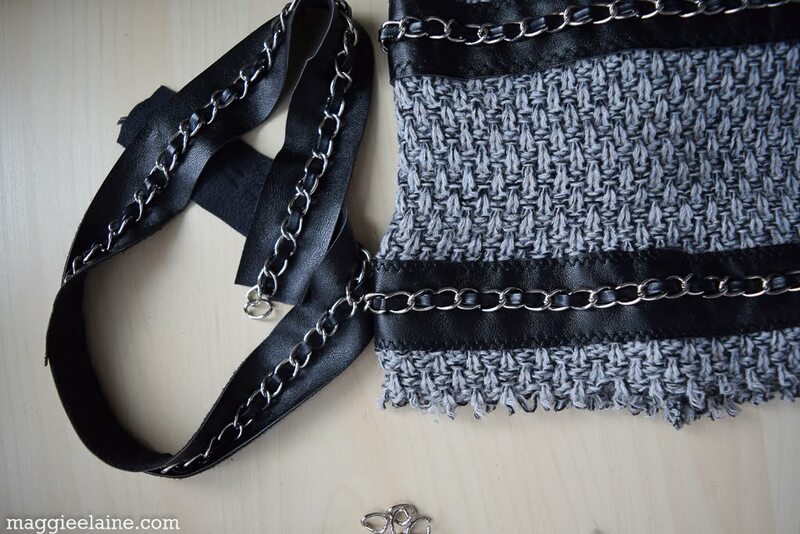 The project was to make a small handbag. Easy right? Not quite for me. You all, I was overwhelmed. I would knit a couple of rows correctly, then the next few rows were totally different (like backwards), then I would get back on track, and then fall off again. Let’s just say my dream of knitting this amazing coat was short-lived. Fast forward a few years later…I learned how to sew; and thankfully it has been a much better experience than learning how to knit. When I saw this beautiful chunky wool sweater knit from Italy on Fabric Mart’s site, two things came to mind. 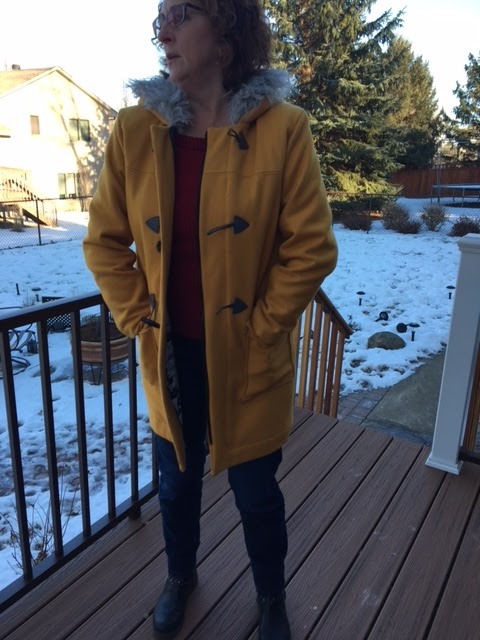 My beloved sweater knit coat and Simplicity 8217. 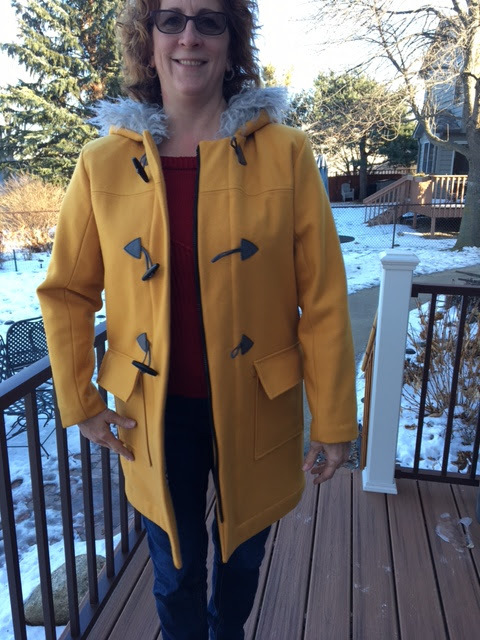 I thought to myself, it would be so cool if I could “sew” a new version of my coat! So I did. Guess what! This fabric is still available, click here. It is lovely and not itchy. When I received this in the mail, I hugged and snuggled with it for a few minutes, lol. 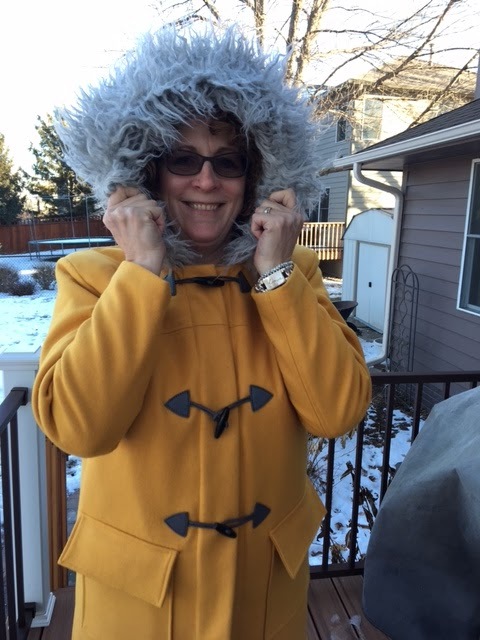 It was a cold and rainy day in Vegas when I took these pictures and this coat kept me very warm and toasty. I also really love this navy/white fabric too, click here. (hint, hint: as of this post there is a *special offer price, so make sure you click the item in your cart to see). 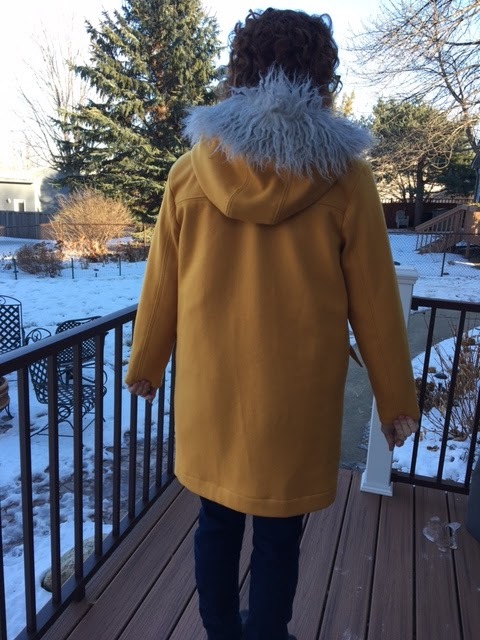 I made view B. I cut a size 12, and although this coat appears to have an over-sized look, I felt it looked a bit too big, so I ended up taking one inch off each side. This pattern is designed so that you close the sleeve and sides in one continuous stitch, so it was easy to take out the extra. 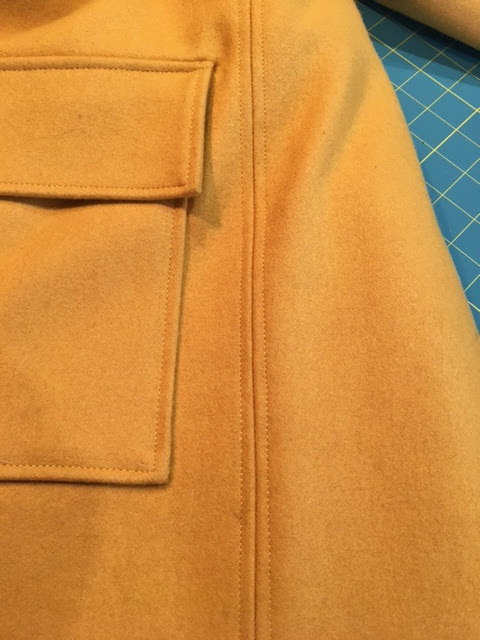 I also shortened the pattern at the waist by 1/2 inch. Sweater knit is not a recommended fabric for this pattern, but I felt this chunky knit would work once I attached the lining to give it a little extra weight. I used ponte knit to line it. Now my hem gave me the blues!!! I attached the lining to the hem and it just would not hang right. However, it was a sign! 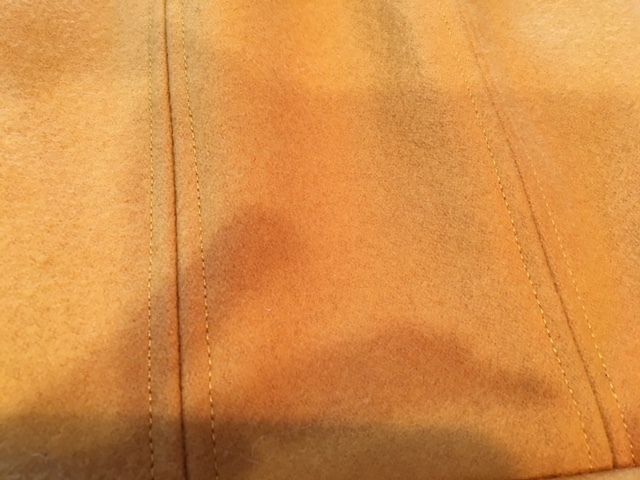 I loved how the bottom of the coat and sleeves looked with the raw edges. I thought about leaving the edges raw for two days before I stitched the lining and fabric together at the hem. When I saw that it was hanging horribly, I took the hem apart and just finished the hem on the lining and shortened it a bit so that it would not hang from underneath the fabric. I did not experience much fraying with this fabric, but I do intend on adding a little fray check to the raw edges and perhaps stay-stitching a little above the edges. To add a little interest to the look, I attached a faux leather/silver chain trim to the sleeves and around the bottom of the coat. 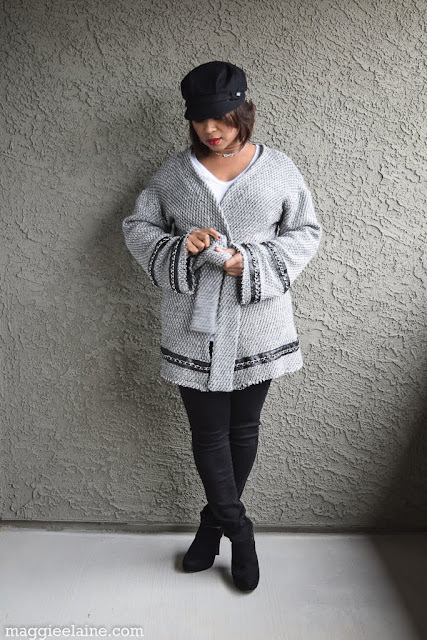 The trim and the unfinished hems give this coat an edgy look. When I attached the trim at the seam, I was careful to move the chains out of the path of the needle and foot. Once the trim was sewn into the seam, I linked the chain together and removed any excess chains with jewelry making tools. The tie ends are attached by inserting them inside the middle of the dart. The darts and tie ends are all stitched together as one. It's a little difficult to see, but this is a picture of the dart on the wrong side with the tie end stitched into it. This is a close up of the tie end on the right side, stitched into the dart. 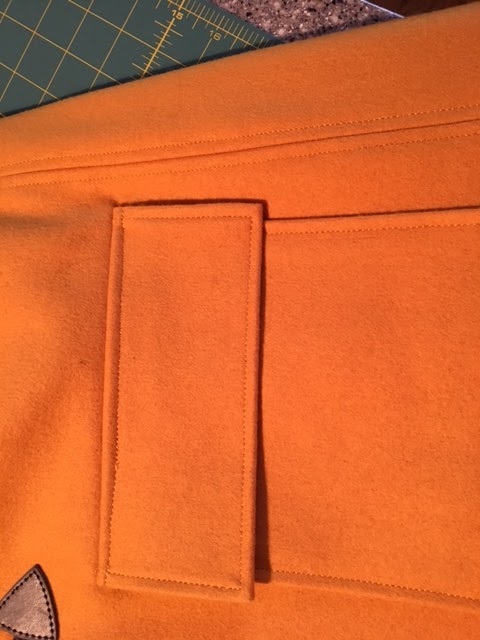 One last thing, I used my walking foot to stitch the sweater knit and ponte knit lining pieces together, along with a zig-zag stitch. Then I went back over each seam with my serger. I also trimmed and top-stitched and/or under-stitched in areas to remove excess bulk. I set my iron on the wool setting and pressed lightly on bulky areas. I am happy with the finished product! That's all for now! Hope you enjoyed! Until next time, be well! 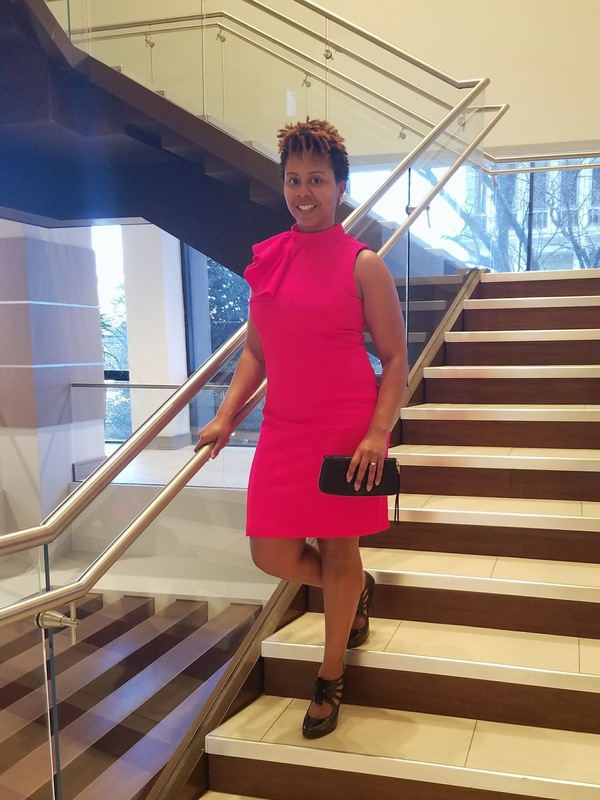 In my last post, I showed you my travel wardrobe and a few hints as to where I was going to wear it. And the correct answer was: Barcelona, Spain!!! My family and I were in Barcelona for 11 days at the end of December. It was our first time ever in Spain, and we were very excited because we were going to get to see our daughter, who has been in the Peace Corps in Madagascar for the last 10 months. 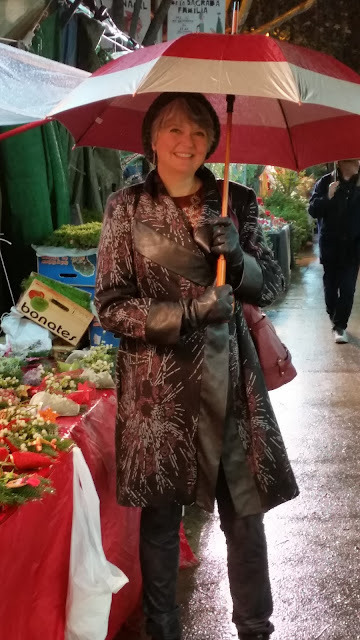 The first two days it was raining, and I definitely needed the centerpiece of the wardrobe, this coat- made from a double knit, trimmed in leather, using Butterick 6384. The above shot is at an outdoor Christmas market where they were selling all kinds of greenery, flowers, nativity scenes, Caga Tio's and Caganers. Caga Tio and Caganers are very unique Catalonian traditions. I won't go into them here, but definitely check it out if you don't mind a little potty humor. When we travel, we always stay somewhere where we have a kitchen, so that we can cook one or two meals a day at home. We could spend hours in supermarkets, just fascinated by the different foods, and deciding what to cook. Wine figures predominantly in the Barcelona culture, and you can buy really good wine straight from the barrel for $2 a bottle at the supermarkets. I love how they've wrapped the wine barrels in garland for the holidays. There are crazy sculptures everywhere you turn in Barcelona. This picture is in front of a very famous sculpture called the "Barcelona Head" which is on the waterfront. Barcelona is on the Mediterranean and is a historical port. After the first two days, the sun shone every day, and I really had no more need for the coat! The weather was gorgeous, but still a little chilly, so I was really reliant on the fleece vests. 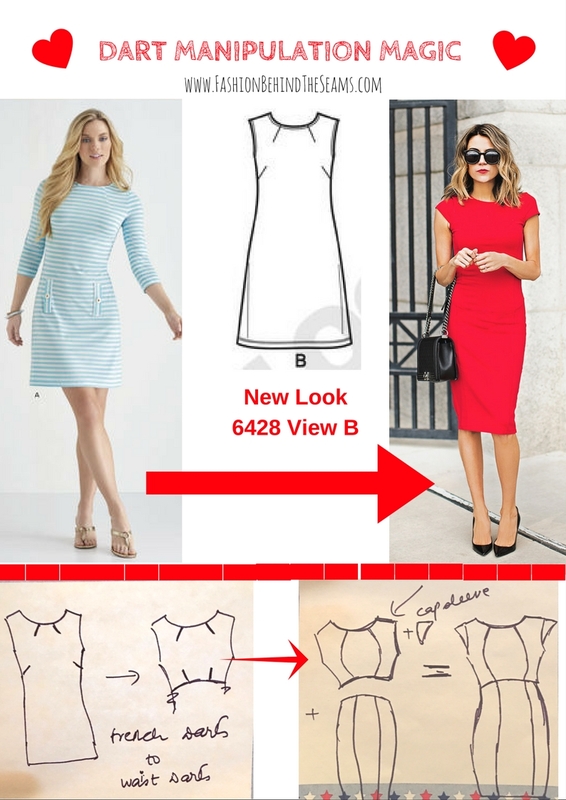 This red one is made from a quilted knit and Butterick 6388. It doesn't have any pockets because I didn't have enough fabric, so I liked wearing it with this striped top that had patch pockets. When traveling, pockets are incredibly useful. As long as something has pockets, you feel secure! I did carry a purse, and never felt like I was a target for pickpockets, but that might be different in the summer when there are more tourists. 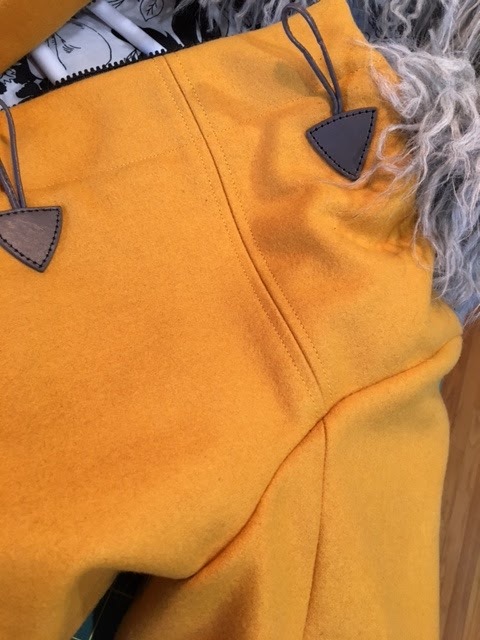 Audrey from SewTawdry did a great post about how to add hidden pockets, which I would like to do for future excursions. 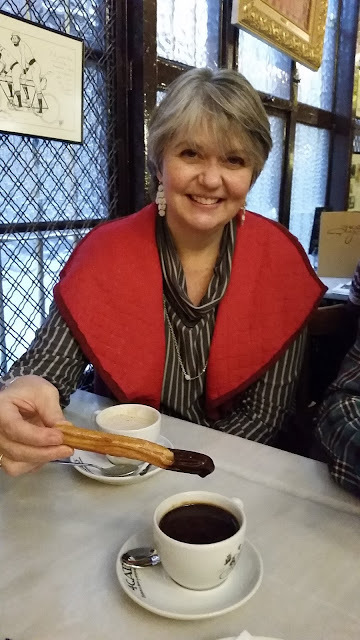 I wore each outfit 2-3 times, so here you see it again in the Els Quatre Gats bar, having Spanish hot chocolate and churros. Their hot chocolate is really like a hot pudding. Out of this world delicious, and muuuyyyy fattening! We tried to have this every day, it was so good. Els Quatre Gats means “The Four Cats,” which is derived from a Catalan expression which means “only a few people", or nobody important. This is where Picasso hung out when he lived there with his cool artist buddies. It's ironic that many of the "cats" that hung out here became really important. 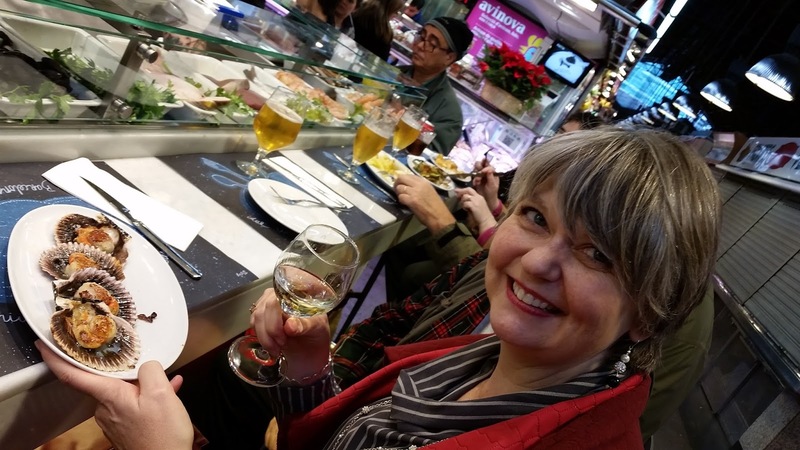 Here I am in the same outfit at the Boqueria Market on the Rambla, eating fresh scallops still in their shell. Seafood is really popular here, as is paella. There were quite a few fabric stores, and really nice ones too! I think that Ribes and Casals is like their Mood- two stories, lots of really beautiful sequined fabrics, laces, etc. You could spend some serious dinero here. And this place was hopping- lots of customers and activity! The business hours in Spain are frustrating for Americans. Many shops open at 10, close at 1, then open again at 5, and stay open until 10 pm. This gives the employees a chance to go home, have a nice lunch and be with family and friends. We would often seek out a cafe and have more coffee or hot chocolate during this period. Which was good because it gave us time to catch up with our daughter who has been in the Peace Corps in Madagascar for 10 months. Barcelona was a halfway point between us, so she met us there. Here we are catching up while the Barcelonians are on siesta. 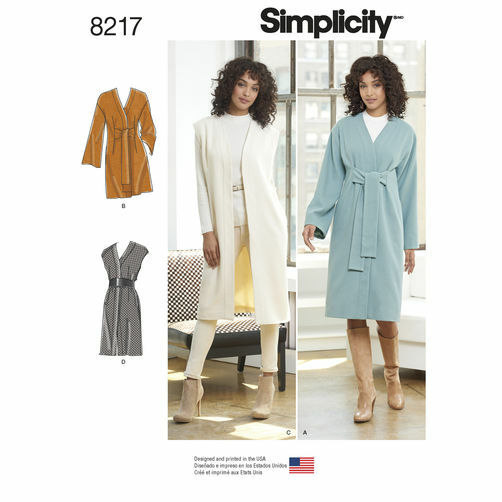 Notice, here is my brick tunic, from Simplicity 8265. Now, I do have a funny story regarding this daughter. Coming from Madagascar, she didn't have any clothes appropriate for the cooler climate in Spain, so before we left, she asked if she could wear my clothes. Even though she's smaller than me, she has always loved wearing my clothes. I said, "I've gained weight since you saw me, and my clothes would be way too big for you now, so no, you can't wear my clothes! I'll pack a suitcase full of some of your old clothes that will fit you." The very first morning, I went to wear the dress that I had made, and it was missing- and I found it on her! She said "You really didn't think that I wasn't going to wear your clothes, did you?" So the travel wardrobe got worn by both of us, the whole trip! She hardly wore anything that I had brought specifically for her. 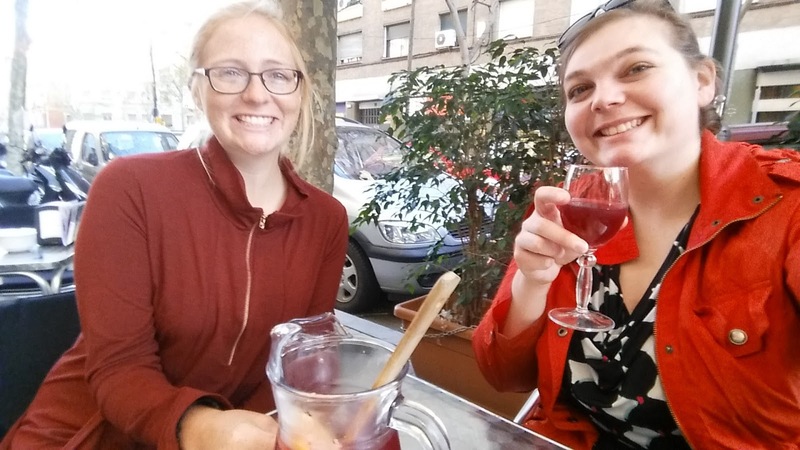 Here she is in my brick dress with her sister, having some sangria and tapas. This dress was probably in use more than any other piece in the wardrobe, mainly because she kept wearing it! And this is what tapas look like in Barcelona. 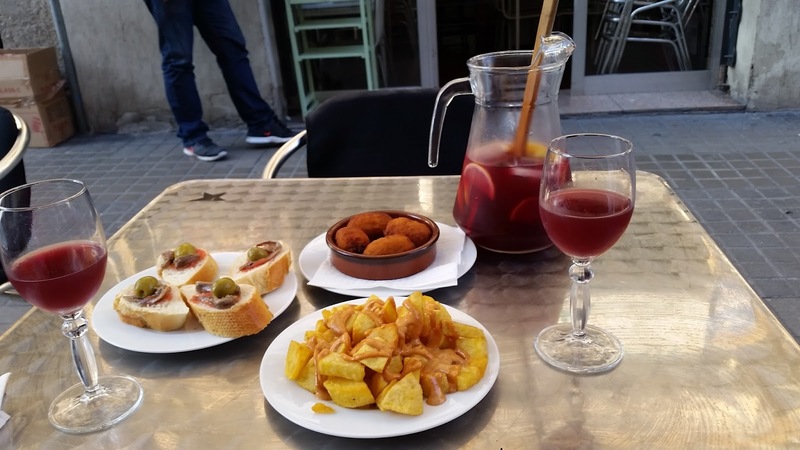 Tapas are little snack plates that you eat in between lunch and a late dinner at 10 pm or later. They are pretty economical- usually between 3-5 euros a plate. 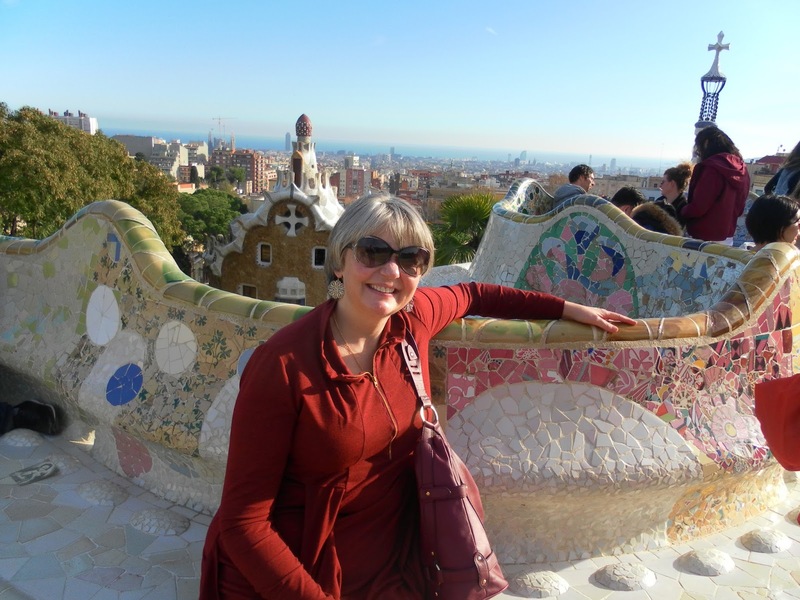 And here I am in the same dress at Parc Guell, the masterpiece park of the architect Gaudi. Gaudi's work is all over Barcelona, in apartment buildings, parks,and an incredible cathedral. Barcelona has 9 UNESCO World Heritage Sites and most of them are designed by Gaudi. He is truly one of a kind. 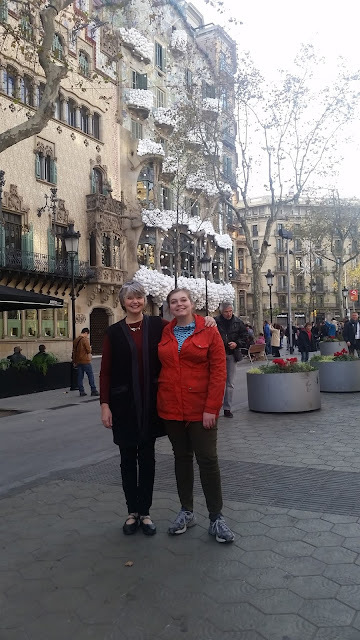 Here my daughter and I are in front of one of Gaudi's apartment buildings in the "Block of Discord", so named because of many unusual buildings just in that block. I'm wearing the black fleece vest and brick tunic. The black fleece vest got worn equally as much as the red one. Both were smart picks. I brought the black tunic for wearing when I felt like something a little dressy was needed, and on Christmas Eve, I wore it to a Flamenco performance at the Palau de Musica, another must see spot in Barcelona. Flamenco is a traditional Spanish dance, and the costumes were gorgeous. And I wore the black tunic again when I went fabric shopping in our neighborhood. 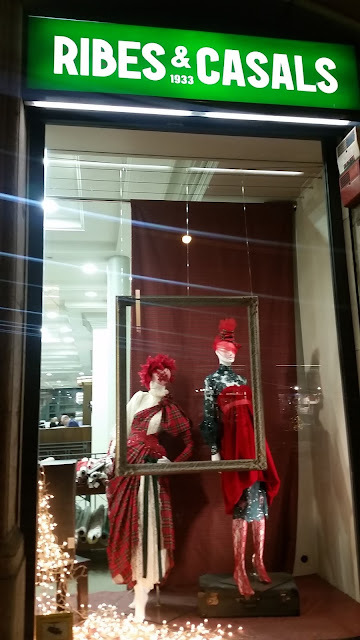 This is in a store that was filled with beautiful woolens, floor to ceiling. I haven't ever seen such a selection of wool! Which is kind of surprising, as I don't think it ever gets very cold there. But based on the clothes I saw in second hand stores, wool, leather, and fur are all quite popular. I came home with the blue and purple piece that my arm is resting on. The most spectacular place in Barcelona is the Sagrada de Familia- the Gaudi cathedral that has been being built for over 100 years. Words cannot describe it- you really have to be inside it to appreciate it. Our apartment was just a couple of blocks away from it, and this is the breathtaking view that we had at night. Regarding the other items, absolutely everything got worn at least twice, most 3-4 times. My one regret: I should have taken more comfortable shoes. I really was being vain not bringing tennis shoes, and I paid the price for that with sore feet! The only thing that I would change is to have made everything out of synthetic fabrics. We did do laundry a couple of times, and there are no dryers there- everything has to be line dried. So, my cotton french terry tunic took almost 24 hours to dry. Everything else dried quickly. I wish that I had the opportunity to do more snoop shopping for ideas, as the city is really filled with interesting boutiques. A lot of the apparel that I saw was made in Spain, and the quality was a notch above what I see in stores in the US. I brought home some incredible second hand finds, cuts of fabric (of course), and some issues of the Spanish pattern magazine- Patrones. 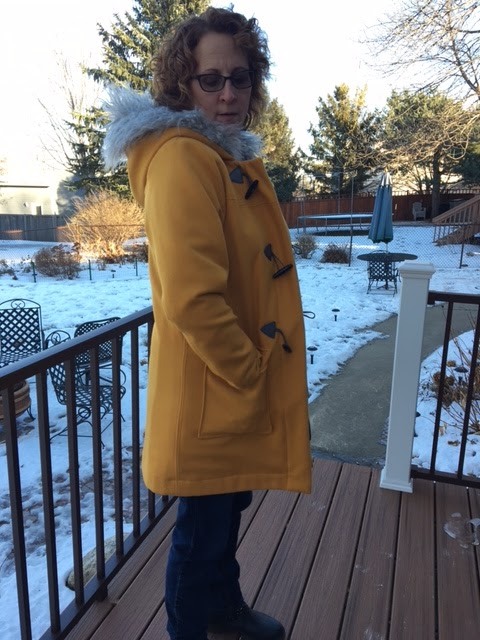 And best of all, I am still wearing the heck out of this travel wardrobe here in Illinois! So, all in all it was an incredible trip, and I feel so lucky to be able to have all of our family together for the holidays. If you've never been to Barcelona, watch the movie "Vicky, Cristina, Barcelona" for a great view of the city and Javier Bardem! Being the last minute that I am, I am surprised that I already have my valentines day dress done! The dress was a bit of a pattern hack. 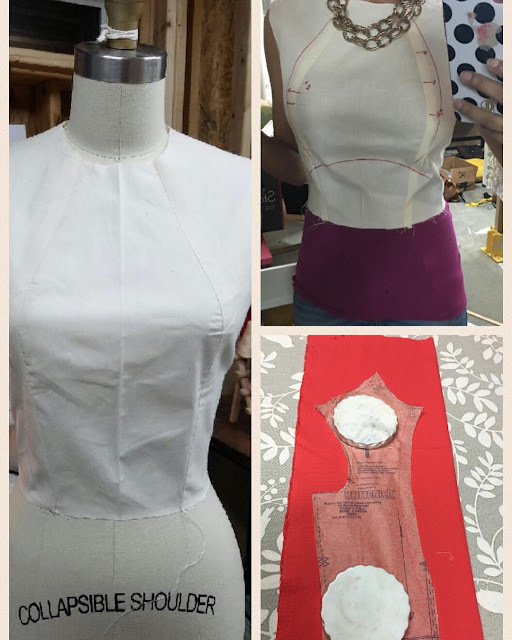 I started with the bodice of a Butterick pattern. Then made some pattern alterations, made the style lines on the bodice style lines curvier, and raised the waist to a curved empire waist. The red lines are my pattern alterations after making the 1st muslin. The skirt pattern was self-drafted and I am in LOVE with the fit of this dress. If you want to look into drafting skirts, here is a class I recommend. This is the same teacher I studied with. If you want to see my review of this class, click HERE. Initially, I was planning on doing the following pattern hack, but then I found the Butterick pattern for the bodice. The fabric I used is this one. I love the fabric. It's a lightweight twill with a 10% stretch. It nice to work with, presses beautifully. I really enjoyed working on this project. Tailoring a garment is one of my favorite things to do! Next, I am working on some simple tees for the winter- some basics to add to my wardrobe.